VLC Media Player, the best media player for Windows, has become even better with its latest release. Not surprisingly, it supports Windows 10 and has a number of improvements and new features. New Interface: The UI has been updated to match the new Windows 10 style. It's also faster on the low-end devices like a Surface RT and Lumia 520,620. Some pretty animations, and also a beta version of a Win2D component for the background slideshow are added. Improved for Lower-end Windows 10 devices: This makeover also speeds up VLC Windows 10 to run faster on Surface RT and Lumia 520, making it one of the top 5 videos players for Windows Phone. GPU Improvements: Improve hardware decoding support based on 64-bit computing of this 64 bit media player. Under this circumstance, a powerful Windows Video Player is needed. It should play any Blu-ray and DVD disc/folder/ISO, SD/HD/4K/H.265 video, audio files like MP3, AAC, FLAC, AC3, WMA, WAV, OGG, etc. and image files like HEIC smoothly with the immersive video and audio effect. Also, it should allow users to select subtitle/audio track, adjust volume, loop video, make gif, add bookmark, take snapshot, check history, record screen, etc. when watching movies. Searching online and testing for multiply Players, I found Brorsoft Video Player (Mac version) fully meets the demands mentioned above. Download and have a try. Step 1. 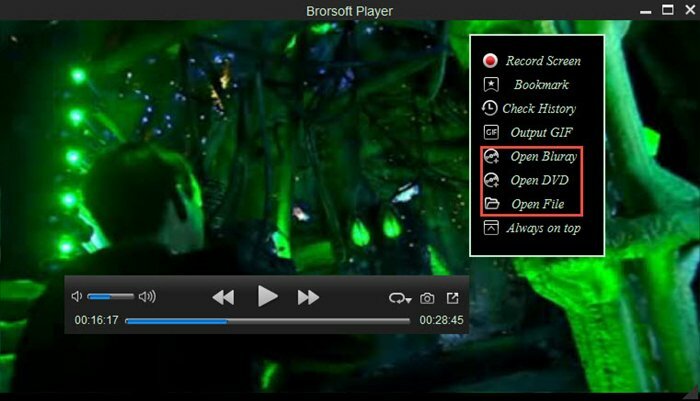 Free download Brorsoft Video Player for Windows 10, install and launch it. Step 2. Insert DVD disc to your Windows PC driver. Or you can insert the Blu-ray into the external driver. Tips: To play ISO file, a virtual drive should be installed on your computer in advanced. Launch the virtual drive and load the ISO file, then you can operate the same way as playing Blu-ray disc.